Scooper - Technology News: Could fintech make travelling safer? Could fintech make travelling safer? Travel is an increasingly important driver of global economic growth. 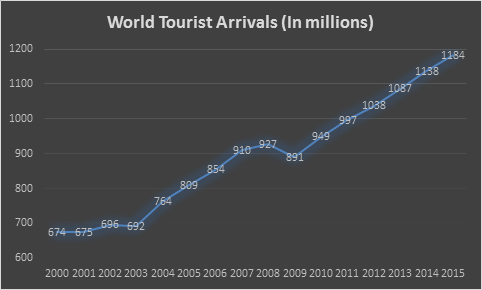 International tourism has grown faster than global GDP for the past several years, and is expected to continue on a positive trajectory. With international tourist arrivals now approaching 1.2 billion , the global electronic payments ecosystem has an increasingly critical role to play in providing individual travellers with secure, frictionless and efficient data-driven solutions. By reducing reliance on cash and enabling transactions in local currency, global networks remove pain points for travellers and increase their security. Technology is making travel even more frictionless. Just as mobile phones have transformed electronic commerce, the near ubiquity of connected devices and geolocation software can be applied to payments and traveller security. For example, financial services providers are now able to compare a merchant’s location with a traveller’s recent mobile location. If the locations match, the information is sent to the issuing bank, which can then confidently approve that transaction. It’s this type of smart use of real-time data that is helping to make the experience of travelling both safer and more convenient. And after all, isn’t that what consumers want? The most convenient and secure payment experience possible. Ideally, that means buying something using a card or mobile device – no cash ever changes hands because the transaction is completely electronic. In some countries, though, that’s not yet possible. There just isn’t the infrastructure to support an entirely cash-free system. That’s where the ATM comes in. For many travellers, the best alternative to paying with plastic is withdrawing cash in local currency at an ATM just before they need to make a purchase. This means that their funds remain in a secure electronic account right up until they are spent. It’s more convenient and safer than having to carry travellers cheques or large sums of cash. And more importantly, if merchants know that a growing portion of their customers are carrying payment cards, then they are more likely to begin accepting cards themselves. It won’t happen overnight. But we’re already starting to see change. The strong performance of the travel and tourism sector, fuelled by the rapid growth from emerging markets , has created a virtuous circle, as industry and governments work together to invest in facilities, infrastructure, human resources and technologies that enable a growing share of the world’s population to travel abroad within a more secure environment.